What is it like to be a student at Lake Pointe? Great question! Part of the answer depends upon the grade level and what the student is looking for certainly affects things, too. For the youngest students, being a student means the best of both worlds. Children get the school social experience by attending campus classes twice a week -- and that means classroom buddies and loving teachers. But they also get majority time at home with a parent, getting to spend quality time learning in the family, without the school time getting old and tiring. Children run to class on Tuesdays and Thursdays, because they want to see their classmates and teachers. The time on campus is busy, but very enjoyable! The day is a long one, but it is only two days per week -- Tuesday and Thursday. 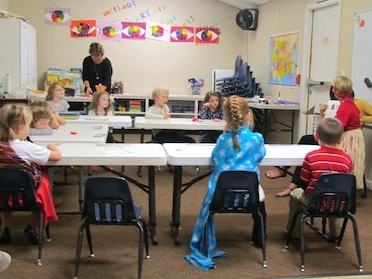 Small class sizes mean the primary students get to know their classmates well. The teachers and assistants have deep love for the students and for learning, and it shows in all subject work. Learning new concepts shows students what they can know, and practice and discussion time lets students share what they have prepared at home with mom and dad. There is much to do in a campus day, but movement around the classroom and a variety of exercises, games, and discussion make the learning pleasant -- and exuberant. 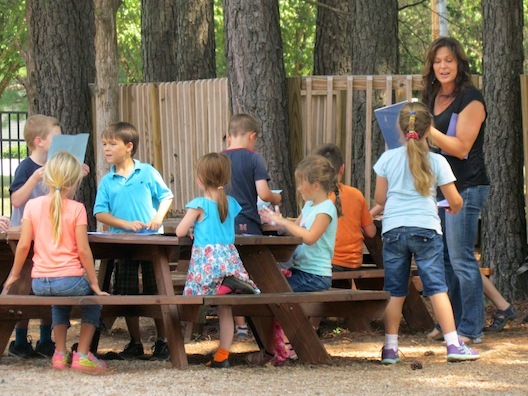 Snacks and lunch are eaten in the classroom to make sure that eating takes place, in all the excitement, because two recesses allow the children to blow off some happy steam on their private playground. At home, the children work with a parent to practice, practice, practice what they've been introduced to at school. The primary grades are all about knowing and memorizing facts and about practicing and improving basic skills --- tools that will enable the children to really soar in later grades. Usually working with mom, the student works through planned exercises, while also reinforcing that the parent sets the tone and that it is the child's job to trust and to obey. A variety of activities supplements the work, and the day is a pleasant blend of routine and new discoveries through reading, discussion, videos, and activities and games. Best of all, the student can work at his own pace, finishing some activities more quicly, and being able to go more slowly on areas that do not come as easily. There is no commute on at-home days, so right after lessons are completed, the student is ready for chores and play time. Most of student life outside of the classroom is left to the direction of the parent. Moms and dads of little ones often don't need more activity in their lives and more places to drive to in the car. Athletics are left up to ROAR Sports, as well as to church and rec leagues and a lot of play opportuntiies are scheduled privately between classmates' parents. But LPA does schedule strategic opportunities to develop fellowship and fun for students and parents alike. Parents often linger on the playground after classes, providing fellowship for themselves and more play time for their kids. Lake Pointe has scheduled events for young students, including a fall festival in autumn and a field day and picnic in the spring, both of which are planned and executed by LPA secondary students. Speaking of the older students, many will visit to play with the younger ones at lunch time a few times each year. Arts, science, and history nights provide opportunities for students and parents to get together in purposed fellowship.